Try an Aquaint Sanitising Water for free! Vital Baby Aquaint Sanitising Water is revolutionary – a 100% natural cleaning water that kills 99.9% of bacteria in seconds! If you’ve ever been out and about and baby has dropped a toy or soother or you’ve had to use a public changing table or high chair, then you will appreciate how remarkable Vital Baby Aquaint Sanitising Water is. It’s a multipurpose, 100% natural, antibacterial Sanitising Water that kills 99.9% of bacteria in seconds. Containing no alcohol, harsh chemicals, fragrances or preservatives it’s safe for use on hands and body (from birth), surfaces and even items that go in the mouth, with no need to rinse. 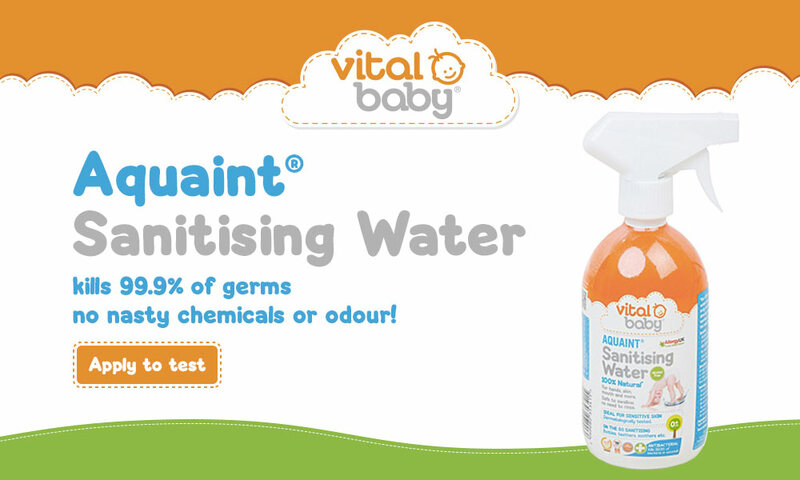 Not only is Vital Baby Aquaint Sanitising Water great for when you are out and about but it can also be used anywhere around the home, giving you extra peace of mind in the knowledge that you are not spraying any nasty substances around your living areas. Endorsed by Allergy UK, it is suitable for those with allergies or sensitive skin and having passed stringent UK drinking water tests it’s the safest eco-friendly sanitiser on the market. As a travel companion, Vital Baby Aquaint Sanitising Water provides parents with a single, unrivalled level of hygiene in a handy 50ml bottle. 20 packs of Aquaint Sanitising Waters to try!